When it’s ‘all going crazy’ out there, what are we to do, as educators? We have to provide an alternative rhetoric, other ways of seeing and doing things. To quote the American First Lady, ‘When they go low, we go high!’ When the rhetoric around us is full of hatred and vitriol, scorn and derision, separation and division, we have to tell a different story. When the world is full of darkness, we don’t counter with more darkness but with the light of courageous love. Let’s not allow a picture of love that is pink and fluffy, romantic and sentimental and then dismiss it. Real love is gritty, daring, brave and fierce. Love that does not look at what others think, that does not look at what you have or do not have, that does not look at how you look, is not an easy, flippant thing. That sort of love is the sort of love that can enable young people to stand back from the current of hatred and believe there are other ways. There is always an alternative rhetoric taking place. We need to be pointing it out and providing ways for our youngsters to participate in this alternative view of the world. If we can show them others who are ‘helping’, others who are resisting the hatred and choosing love, those who are resisting prejudice and choosing respect, they have somewhere to go. It is our enormous responsibility to avoid joining in the hatred. We have to not only be a voice of reason but an example of difference. 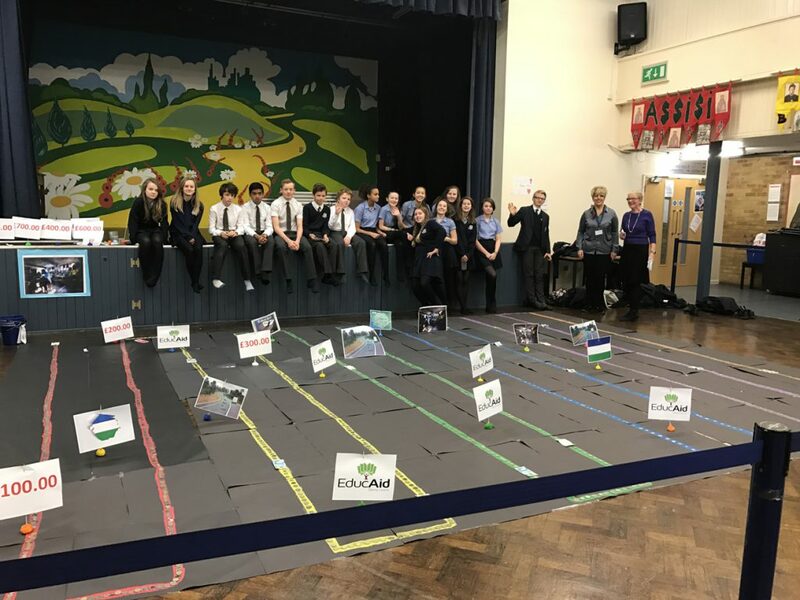 The other day, in a town in the UK where I have heard unbelievable racism in the past and where the majority voted to leave the EU in the Brexit referendum, a group of Year 9 pupils excitedly participated in the construction of a silver mile, representing the mile leading to the EducAid school in Lumley – this represented £1071 in coins after various fundraising activities undertaken the day before (and the figure climbed further as the day wore on). At the same time, the rest of the year group were in live discussion via Skype with students in Freetown, sharing ideas about the future and their lives at school. Their next project is to do a talent show in each school, choose the best 3 acts and then perform them by Skype to each other and then find an ultimate winner or two! The excitement at sharing ideas with young people, also in pursuit of an education but from such very different cultures and experiences, was wonderful. From both sides, there was real appreciation of the opportunity to engage. Well done to all of the young people involved in Blessed George Napier School, Banbury (my old school, as it happens!) and to the dynamic students in Lumley, Freetown. This sort of sharing and exchange is exactly the sort of activity that can start a discussion that challenges the rhetoric of ‘us versus them’. It is exactly the sort of activity that can give a young person seeing the world around them in turmoil, a place to hold on and stay grounded in decent values of love, community and sharing. If you are interested in knowing more about EducAid’s work with vulnerable young people, please go to www.educaid.org.uk. If you are in a position to support EducAid’s work, please go to My Donate to donate now.